Clones are by definition, "a group of genetically identical cells descended from a single common ancestor." 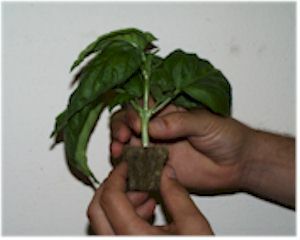 In clonal propagation, roots are induced from a portion of the stem, root, or leaf. Clones or cuttings can be taken from a favorite plant and repeating the cloning procedure, you can grow the strain continually and indefinitely. The first thing you will need to do is condition the rockwool that you plan to plant the cuttings in. You will want to soak the rockwool in water that's pH has been adjusted to 5.5 overnight. This will neutralize the pH of the rockwool. This step is important because rockwool is very alkaline and putting a cutting into untreated rockwool could greatly reduce percentages of rooted clones. Now that your rockwool is prepared you must select a plant to take cuttings from. Generally you will want to select the plant that is the healthiest and most vigorous of the group. Healthy mother plants will speed the rooting of the cuttings and increase your success rate so choose wisely. Also, keep in mind that all the clones you take will display exactly the same characteristics of the mother plant so make sure you pick one with desired growth characteristics. After selecting the best plant from the group, it's time to get all your stuff ready to take the clones. Go ahead and put the black tray insert in the propagation tray and prepare a bottle of cloning solution mixed at 6 ounces per gallon of water with a pH of 6.5. Make sure you have a sharp and clean razor blade handy. Now select a portion of the plant to take the cutting from. Generally you want to select a branch or stem that has at least 2 or 3 sets of leaves. Locate a spot on the branch between, or next to, a set of leaf nodes where your cut will be made. Leaf nodes are where the branches come out of the stem. Leave at least 1 set of nodes above the cut. Make a clean, neat, 45 degree slice with your razor blade. It is important that you do not damage the branch while handling. Now that the cut has been made you must work fast because time is against you. 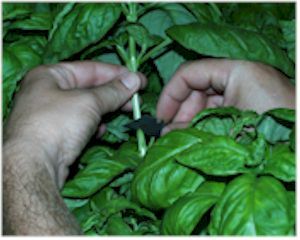 Remove the lower 1 or 2 sets of branches leaving the upper set of leaves to be placed above the surface of the rockwool. 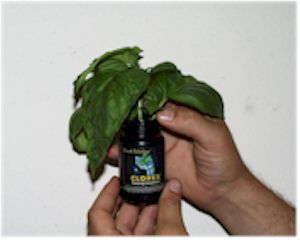 To prevent an air bubble (embolism) from lodging in the stem where the cut is, immediately place in a container filled with your cloning gel. After you have dipped the clone in the gel place the cutting in the rockwool cube immediately. Place the rockwool cubes in the black tray insert spaced apart just enough so the leaves are not overlapping or touching. The leaves may get moldy if they are laying on top of other leaves because of the high humidity in the dome.